Grape Root Borer – Do I Need to Treat? A number of growers have recently asked about treatments for grape root borer. Grape root borer (Vitacea polistiformis Harris) is a comparatively large clearwing moth. The adults can resemble Polistes wasps, and can often be confused with these insects, especially since it is often easier to see a wasp in a vineyard than an adult grape root borer. See the images that compare the 2 insects below in Figure 1. Figure 1. Polistes wasp on left, compared to male grape root borer on right. Credits Hermann 2012 and Copeland 2012. One important difference is that grape root borer (GRB) larvae feed inside grape roots, while wasp larvae do not. Although the grape borer is more of a southern pest, it is present in New Jersey and can be a pest that does significant damage. Adult females lay eggs on the vine surface and on weeds near the crown. Shortly after hatching the larvae enter the crown and central root system, boring into the roots where they can last for 2 years. When the larvae mature, they exit the wood and pupate close to the soil surface where they emerge from early July through August. GRB is not considered an economic pest until about 5% of the vines are infested. This is determined by examining the bases of numerous vines at weekly intervals for signs of adult emergence, or pupal cases (exuvia), throughout the summer, see Figure 2. Pheromone traps can also be used to measure adult emergence, but since they attract moths from both the surrounding woods and vineyards, they are practically useless to tell us what is going on in any specific vineyard. Counting pupal cases is labor intensive, but does tell us if the vineyard is or is not truly infested. Figure 2. 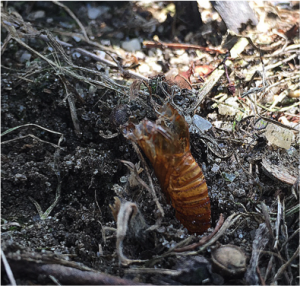 Pupal case from newly emerged adult GRB. During 2015 -’16 we monitored 2 plantings at each of 9 vineyards. During that time we found 3 vineyards that had populations of GRB that merited treatment, or were above the 5% infestation level. While infestation levels can change over time, this does tell us a few things about GRB in NJ. First, about 33% of the vineyards we sampled had economic populations of GRB. Therefore growers need to determine if they indeed have GRB populations that merit treatment prior to actually doing a GRB treatment. Secondly most GRB adults emerged from the soil a little later than we first thought. Counting the pupal cases over time, we can get an emergence curve as in Figure 3. This vineyard does merit treatment, since the total vines infested is over 5%. Most of the insects that emerged peaked in late July and early August. Figure 3. 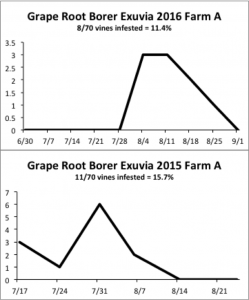 GRB exuvia counts over time Farm A, 2015, ’16. Treatments: If the vineyard has an economic population, then the standard treatment would be using Lorsban at the start of adult emergence, which would be now in most years. The material is applied to the soil around the base of each vine, and forms a barrier that kills young larvae as they burrow into the soil and root system. Growers can use any of several formulations. The rates vary depending on the formulation that is used. Lorsban Advanced: Use 4.5 pt/100 gal, with 2 qt applied to a 15 sq ft area around each vine; Lorsban 4E: Use the same amount as with the ‘Advanced’; Lorsban 75WG: Use 3 lb/100 gal, with 1.5 qt applied to 11 sq ft around each vine. There is a 35 day PHI with Lorsban products for grapes. 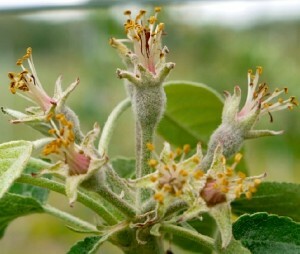 Do not contact the fruit surface, and apply only to the soil at the base of each vine. 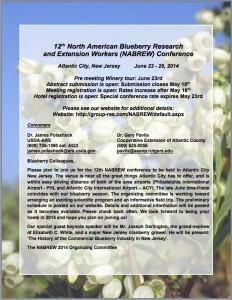 Every 4 years, research and extension workers from throughout North America and abroad meet to exchange ideas and research results on current blueberry issues. This year’s conference is being hosted by Rutgers University and USDA at the Sheraton Atlantic City Convention Center Hotel, New Jersey. New Jersey is “Where it all began” – where highbush blueberries were first bred and cultivated. In addition to updates on current extension and research activities, there will be tours of a winery, blueberry production areas and packing facilities. The program will highlight new varieties, and the management of diseases and invasive pests like spotted wing drosophila (SWD). 6:10 Walking tour of Gloria, PF-17, and Sentry. Identification of insect pests, proper monitoring procedures and management. 6:40 Identification of peach and nectarine diseases and management timing.